Junior Champion Doe all-breeds at the 2008 Royal Melbourne Show. Glenafton Anglo Nubian Stud is situated in Victoria's South West at Woorndoo. Stud Principal Sharyn Carmichael has been breeding Anglo Nubian's in excess of 25 years. We infuse our original blood lines with the lines of the original imports of Anglo Nubians to Australia over 50 years ago, we also have a number of pure Heritage lineage animals. A strong focus of our stud, is to breed high producing, long lactating does, that are able to both mother rear kids, or to be milked by hand- or a combination of both which is preferred. Our stock is reflective of the breed standards, large exotic animals with solid bone. Glenafton is stongly represented in the few shows we attend each year. 24 hour milk tests are conducted on farm, Herd Recording has been undertaken also. Herd health is excellent & stock is tested annually for CAE/JD. Glenafton have supplied stock for export to a range of countries, and many states within Australia. 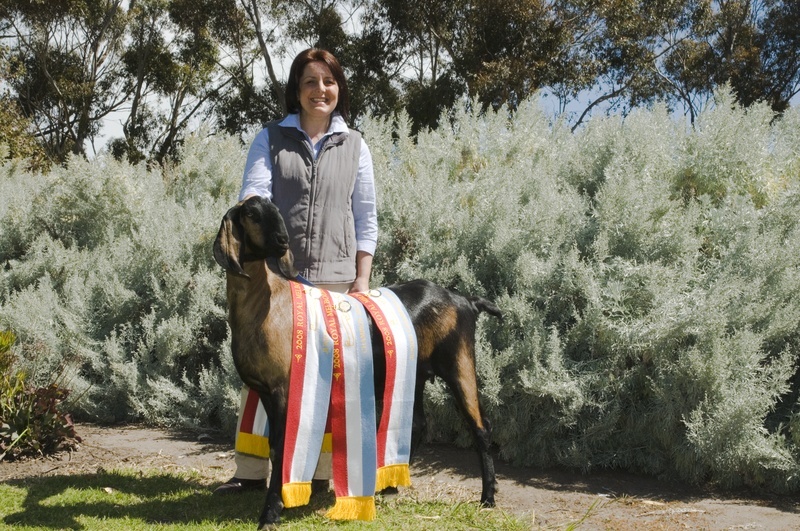 Breeding Dairy Goats is fun and can be rewarding.Jake Carmichael below was awarded Most Successful Junior Handler at the 2008 Royal Melbourne show, all of our family are involved in our Anglo Nubian venture..